EPISTLES FROM THE SCRIPTORIUM: Designer High Pulpits R Us! OK - who has a caption for this designer high pulpit? Found this on Facebook this morning! In what looks to be an otherwise beautiful church, this high pulpit came from the Church of Saint Rocko in beautiful downtown Bedrock (thus the spelling "Rocko" instead of "Rocco"). Or was it Saint Stoneyslaus? Or perhaps Our Lady of the Gravel Pit? Dinosaurs were used for many purposes on The Flintstones. Fred used one to move rocks around from one pile to another for Mr. Slate's quarry. Dinos also served as buses, taxicabs, paddy wagons (Fred got hauled in by one for disturbing the peace once), and even a piano (on the early 70's Pebbles and Bamm-Bamm cartoons, in which Pebbles and Bamm-Bamm are teenagers). 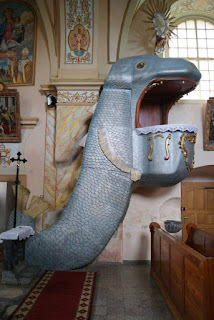 But I've never seen one as a high pulpit until today. Whatever edifice the dino pulpit came from, I'm sure it had rock-solid pews, as well as organ pipes carved from rock (you can see the steam blowing out of them as the music is played). And since everyone in Bedrock walked barefoot, that made the Washing of Feet so much easier on Holy Thursday.